Macabre in style and sharp in design, these fetish fashion designs by Nika Danielska feature skeletal cages that constrict and contort the body for the sake of fashion. 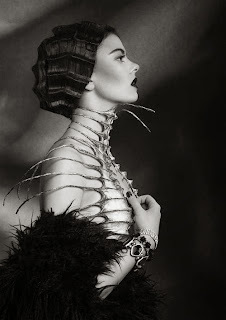 Face masks, neck braces and shoulder spikes make up this daring collection, blurring the lines between pain and couture with their frightening demeanor. 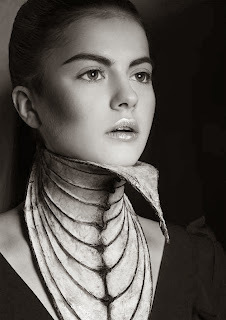 The spindly creations can be worn peeking out from underneath a jacket, or on top of a gorgeous gown, both ways making for some eye-popping fashion statements that are sure to be the talk of any gathering. These intricately wrought pieces are lavish enough to be worn instead of other accessories and jewels, but they would also look glamorously Gothic when paired with some sparkly baubles.